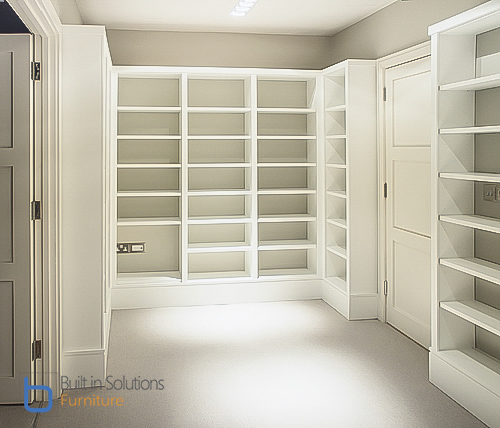 Custom made with the finest detail and quality, and built to fit any room configuration, a Fitted Home Library not only makes good use of the space you have, it also gives you plenty of storage options, and gives your home loads of character. Fitted library shelving is also perfect for displaying prized antiques, treasured family photos, and decorative bits and bobs too! 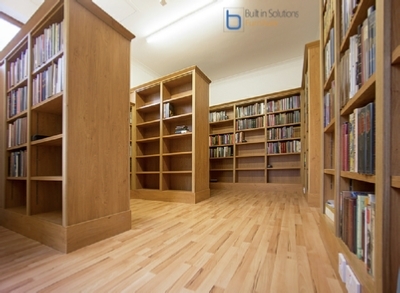 Transform your home with a gorgeous built in library. 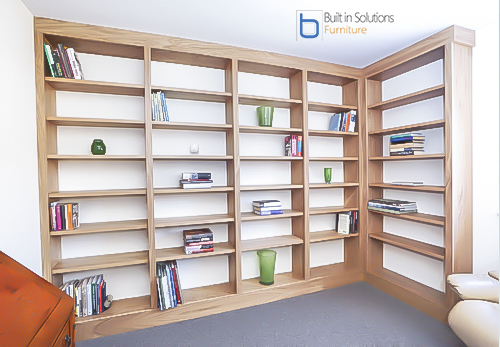 Our handmade and custom fitted home library Furniture is built using quality materials and construction, combined with creative design that can be made in range of materials and finishes to fit perfectly with your décor scheme. We take on projects of all sizes. Similarly, our work comes in a wide breadth of styles, from traditional to modern and everything in between. Interested in a library project? Get in touch and we'll walk you through everything you need to know. A large fitted library in Oak and three and half meters high, made to fit around a doorway. Lots of shelves of different widths makes this library versatile to house all your books without wasting any space, There’s a deeper bookcase on the left for a LP collection as well as larger reference. These contemporary designed bespoke library bookcases wrap all the way around this room allowing for doorways. Fitting neatly in to this space, built to the height of the door frames with matching architraves and skirting, seamlessly blending in to the room. Leaving a free area above the bookcases creates a sense of space. 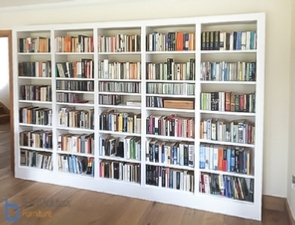 Wall to wall bookshelves for home library painted in white wood. 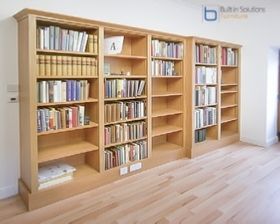 Large wall of built in library bookcases to house a great deal of books. 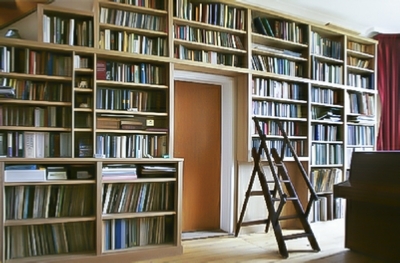 Created with a stepped deeper bookcases for larger reference books. This library bookcase was created in Oak and fitted to two walls into a corner to maximise the bookshelf space. This large home library and study combination with bookcases were stepped to varying depths to accommodate different depth books, and also to create a feature design that looks much better then a flat design. 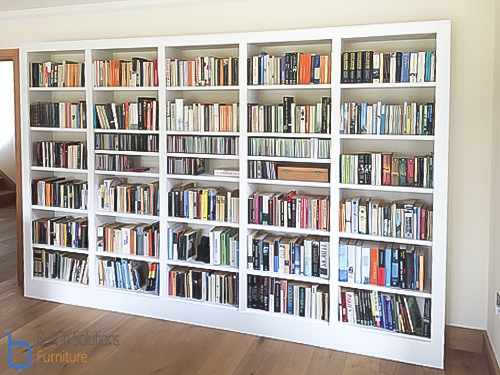 Very large home library created in a double garage conversion to house a life times collection of books for this retired publisher, With masses of library bookshelves to fill and categorise just how our customer wanted. Before you begin, have a think about a few things that will make your library work for you. How much library storage do your books need? Start by measuring your book collection, the last thing you want is not to have enough shelf space in your library. Books come in all shapes and sizes. You may need only a few rows of quite deep shelving for large art books, and then narrow for the rest. Library design: A library can be as big or as small as you like, its does not only have to house books. It can be made to display items as well. Rather then having all one depth, think about a stepped lower part for your especially big books. Doors on bookcases will make handy cupboard space. Placing your Library bookcases: can be placed anywhere on any wall in any room. 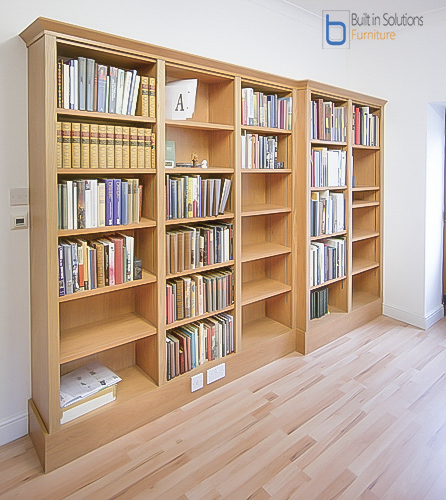 Library bookcases can be created all around your home, in small sections on any unused wall, alcove or corner. Colour for your library: Subtle dark tones with your colourful book look great. With the right lighting and colours, create a wonderful room to relax a read in. 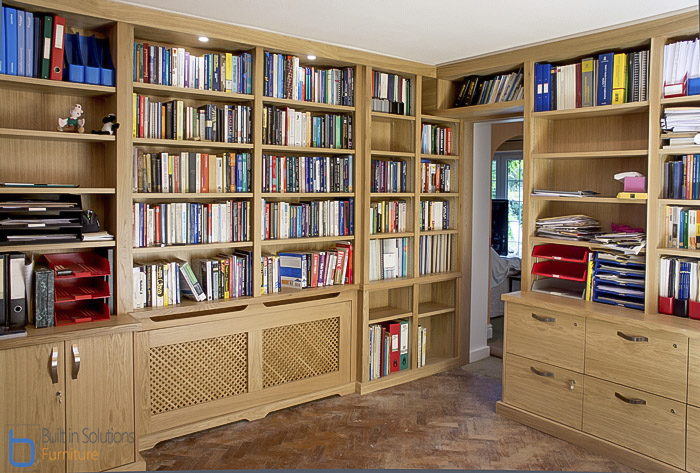 A library in wood: A Fitted library in Oak is a beautiful thing and full of warmth and character. Library Lighting: Creating the right lighting will enhance your library space. Up lighting above the bookcases will give you soft indirect lighting in your room. Front lighting, with lamps on each bookcase, illuminating the front of your books. Lighting strips: can be placed vertically on the side of bookcases if you have glass shelves. Spot lights: Individual shelves can be lit with spots or lighting strips, creating a dramatic design. There are so many on the job carpenters and companies with a wide variation in the quality they provide, typically most 'companies' are on the ‘job carpenters’ that will typically spend the best part of a week to start making your alcove units by cutting up all the material, probably in your beautiful garden, followed by allot of drilling and screwing to assemble the pieces and then sanding, usually in the room the fitted units are to be fitted. After this the library will require painting, which will require 2 coats of primer, and then two coats of paint, oh and not to forget to mention, sanding down between each coat (more rubbing down and sanding of edges if MDF is used) so a good finish can be achieved, allot of disturbance. So probably a good week in total !